The starting position is "troika" formation: one gentleman between two ladies, holding inside hands. Giraudet suggests that the dance will have more "brio" if the gentleman chooses two ladies of about the same height and slightly shorter than himself. Interestingly, he also notes that it may be danced by a lady and two gentlemen instead, though he says nothing about to manage height issues in this combination! The steps are "pas de polka sans interruption" (polka step without interruption). All dancers start on the same foot; Bottallo specifies the right. When the dancers are not moving forward, they can mark time in place with a polka rhythm (1&2). The dance is repeated as many times as the dancers like, or the music permits. To finish, the gentleman takes the outside hands of the ladies and turns them as above (one hand only) "three or four times" without stopping. To do this more easily, Giraudet recommends giving the ladies only the middle fingers of his hands to hold. I would suggest doing these three or four turns as the replacement for the last eight bars of the dance; in other words, start the turns at the usual place, and just keep going. After these final turns, the gentleman escorts the ladies to their seats and and salutes them "profoundly". The last turn with the ladies holding hands is easier to do than to describe. Just don't let go! Giraudet notes that the gentlemen should raise his arms and allow the ladies to turn themselves, without using force. That looks like twenty-four measures of music if one allows the same four bars for each of the "arches", then assumes four bars for the inside turns and perhaps the step back, then four bars for the reverences. That doesn't match Giraudet's published music, which is a mix of sixteen-bar phrases and eight-bar phrases repeated. To cut it down to sixteen measures, one could try to speed up the arches to two bars each and the inside turns to one bar each (allowing one bar for the step back and two for the reverences). That seems a bit rushed. One could also lengthen it to thirty-two bars by doubling the polka segments to eight bars each, or add back the fancier turn that Bottallo skipped and some more polka. With no way of knowing which would have been preferable (or whether they just danced across the musical phrase), I find it simpler just to do Giraudet's version. 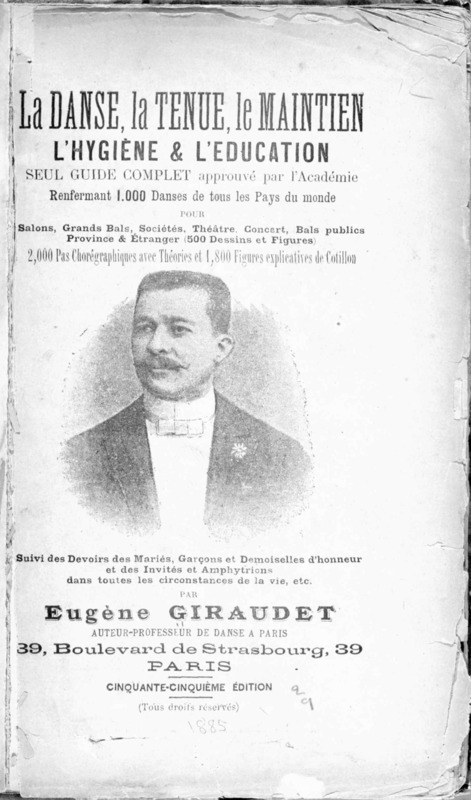 I am not aware of any recording of Giraudet's Pas de Trois music, but Bottallo stated that "le pas de Trois possède une musique spéciale, mais il peut se danser sur toutes les Polka lentes, car il n'est du reste qu'une variante de cette dernière." (The pas de Trois possesses special music, but it may be danced to all slow Polkas, as it is nothing more than a variation of the latter.) In the absence of live musicians or some future recording of the original piece, any slow period polka with a structure of sixteen-bar phrases (or eight-, or thirty-two-) will work. For those with live musicians, the sheet music is available from the Bibliothèque nationale de France. (Updated 1/31/19 to add:) The music is now online at that link. Special thanks to Leo and Katya for helping me test the arm movements in the final figure!